Saul said… “you need to meet the mayor at Cabañas”. Olman said “you have to meet the mayor at Cabañas”. People here respect the mayor and really like him. There really are very few politicians here known for being just and helpful. So… we went to meet with the mayor at Cabañas. I think Napoleon is one of the good guys. 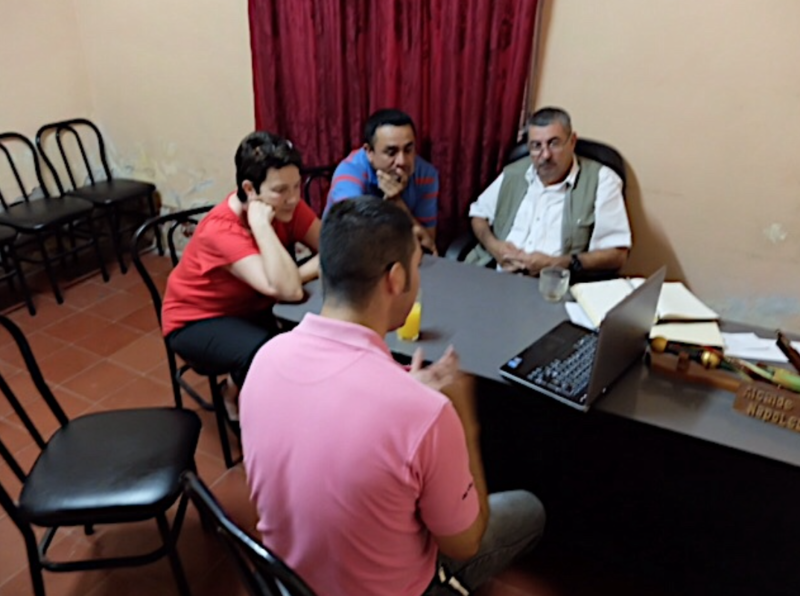 After viewing the presentation that Saul has for the Computer Based Learning program, Napoleon and Carlos put in “a pitch” and justification for initiating a Computer Based Learning program in Cabañas. They will commit to visiting Santa Cruz to learn about the program, orientating a facilitator, paying the facilitator and supplying a facility and furniture… and I will commit to supplying them with with 6 computers for a start. This entry was posted on Monday, February 29th, 2016 at 8:47 pm	and is filed under Copan Ruinas. You can follow any responses to this entry through the RSS 2.0 feed. You can leave a response, or trackback from your own site.